Gone To The Dogs: Who Let The Dogs In? Lucy Davis' acceptance speech (inspired by Sally Fields and Halle Berry's Oscar speeches). "The cat will mew and dog will have his day." The meaning of the Hamlet quote is very simple---everyone eventually gets a chance to shine, even a dog. Our office-dog Lucy recently received an very unusual delivery. Lucy, a 5-pound teacup poodle, has been coming to the office almost every day since she was a puppy. Lucy is an honorary member of the team at Davis Law and even has her own just-for-fun profile page on our website. 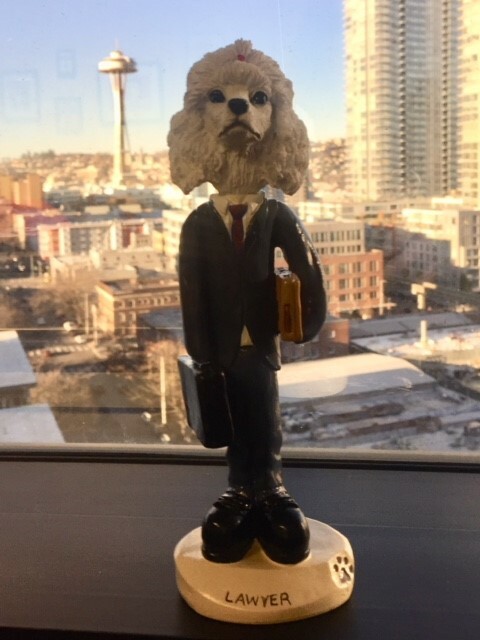 A few years ago, a client who loves Lucy gave us a cute little poodle-lawyer statue as a joke. It now sits on the window sill in my office. But Lucy has NEVER received a delivery, letter or package. She's not an actual lawyer, of course, and doesn't technically help our clients with their car accident claims. So I was definitely surprised when I discovered that she had received a large box containing a plaque. I was absolutely shocked when I read it. Lucy just received an attorney award! As it turns out some of the younger employees in our firm’s communication department read a story about a Texas dog that had received an award from Lawyers of Distinction and decided that Lucy deserved some recognition too. So they nominated little Lucy. Shockingly, she 'won'. And they ordered the plaque. They were roaring with laughter back in November when Lawyers of Distinction tweeted a welcome message to Lucy. But it wasn't until the plaque arrived that the rest of the office was let in on the fun. To take the fun to a whole new level, I made this cute little acceptance speech video with the help of the MyTalkingPet app. Enjoy!